This week's staff profile: Celina Loyer, Aboriginal Programmer. I am Celina Loyer, the Aboriginal Programmer on staff at the Musée Héritage Museum. Working alongside the Program Manager I develop and lead programs that have Aboriginal content and information. 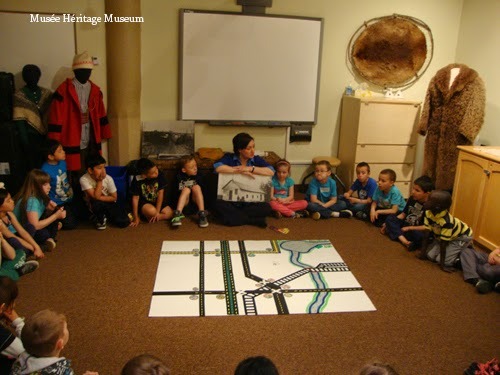 I present a variety of different programs at the museum, the St. Albert Grain Elevator (SAGE) Park, the Little White School and the Father Lacombe Chapel. As well, I help to develop programs, especially for preschool to grade 2. I particularly enjoy working with the little ones, even though I do programs right up to junior high aged students. As someone who enjoys crafting I am fortunate that my interests and talents are part of the work I do and have become part of the teaching I share with visitors and the staff. For example I am a Traditional Metis Finger-weaver and have had the opportunity to share this interest with visitors and staff at our museum and heritage sites. I've also sewed for various projects at work, including making a “River Quilt” for the Spring Along the River program for preschoolers, and try-on Metis clothing for one of our Education Kits. This past winter I have been fortunate to be able to work on a plan for developing a Metis Medicinal Herb Garden, which will eventually be a part of the Cunningham House site on River Lot 23 in St. Albert. One reason I love this job is because of the variety of things I might get to do in a week, whether it’s research, teaching a program for little ones or planning what’s coming next! Come down and visit with us at the museum or drop by one of the heritage sites this summer, we would enjoy meeting you and showing you around! Way to go Celina, keep doing your great work in sharing your knowledge!!! St. Albert heritage sites opening for the summer!